(CNSNews.com) - Former Secretary of State and White House Chief of Staff for former President George H.W. Bush, James Baker remembered the 41st president’s life and impact on the nation and the world during a eulogy at Bush’s funeral at St. Martin’s Episcopal in Houston, Texas, on Thursday. 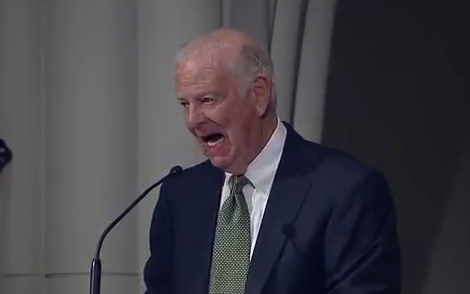 Baker began his eulogy describing Bush as his “friend” and “role model,” followed by an apology. “I must begin with an apology. Heffy, I am about to do something you always hated and that your mother always told you not to do – brag about yourself. I will do this, because it must be done and because as a lawyer, I see that thing beloved by all lawyers – a loophole,” Baker said. “‘Don’t brag about yourself,’ you once wrote. ‘Let others point out your virtues, your good points.’ Well today, Mr. President. I am that ‘other’ with the special privilege and joy of sharing your good points,” he said. “As we have heard, and as we know, George Bush was a charter member of the Greatest Generation. As we gather here to salute him, his incredible service to our nation and the world are already etched in the marble of time,” Baker added. “After becoming the youngest naval aviator, he served in increasingly responsible positions on behalf of this country: congressman, ambassador to China and to the United Nations, director of the CIA and vice president. Then as history will faithfully record, he became one of our nation’s finest presidents, and beyond any doubt, our nation’s very best one-term president.